Obviously, if one is to obtain data which truly reflect rate of protein synthesis in any given system, accurate and precise measures of precursor specific radioactivities are essential. The relationships among the extracellular, intracellular and tRNA pools must be described in greater detail. The complexity of amino acid pools and relationships among them precludes the interpretation of tracer data using simple empirical and static models. In order to adequately describe and analyse amino acid tracer data, dynamic (time-variant) and mechanistic (causal, theoretical) models must be developed. Such models must represent the dynamic relationships among EC, IC, tRNA and protein-bound amino acids, as well as the formation of catabolic intermediates. 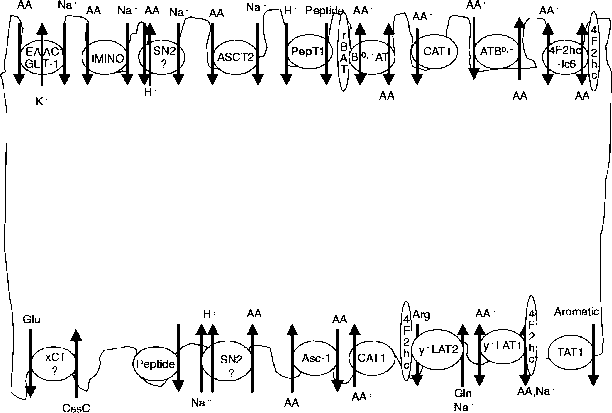 In order to accommodate the several confounding factors discussed above, a generally applicable analytical model of protein synthesis must incorporate each of the entities and transactions depicted in Fig. 16.1. The number of measurements required to solve such a complex model would include: extracellular amino acid specific radioactivity; intracellular amino acid specific radioactivity; aminoacyl-tRNA amino acid specific radioactivity; specific radioactivity of the amino acid in the protein pool; fluxes of amino acid from the intracellular pool to the aminoacyl-tRNA pool to protein and from protein to the intracellular aminoacyl-tRNA pool; and size of protein pool, aminoa-cyl-tRNA pool and intracellular amino acid pool. Such measurements may be prohibitively expensive. However, until results from such an experiment are available estimates of protein synthesis and degradation based on simpler data sets and analytical models must be inter preted with great care. Further, these measurements must be made at varying concentrations of extracellular amino acids.